At the end of September, as the sun set on my (amazing) maternity leave, the three of us headed up to Morehead City for a week on our family house on the marsh. It was exactly what my spirit needed, a week of salt air and nothing to do but sit on the back porch and watch the tides with my baby. While the week’s highlight was probably our first date night away from the baby (thanks parents!! ), we also enjoyed some delicious meals at home. My favorite by far was a simple brown butter and garlic wahoo with an easy caprese salad (everything that’s good about summer, essentially). 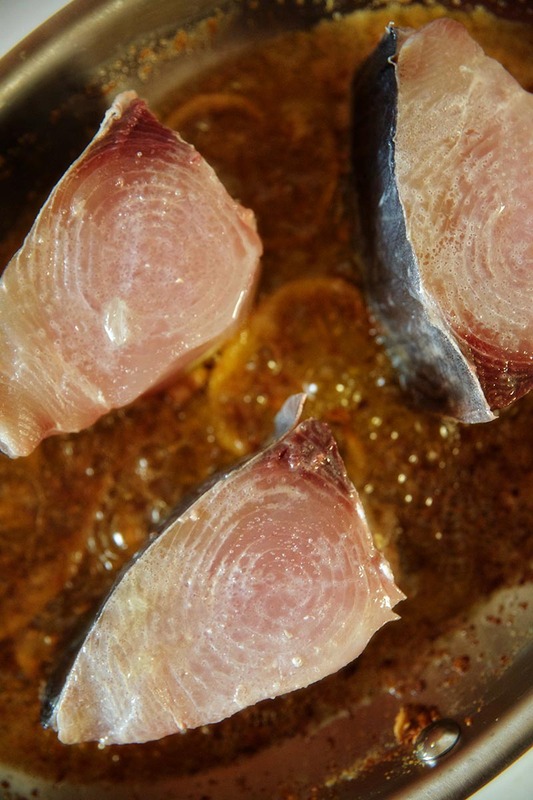 Wahoo is a firm white fish, with a flavor that is delicate, something you want to be careful not to overpower, so I cooked it with simple and quality ingredients that made the fish shine. 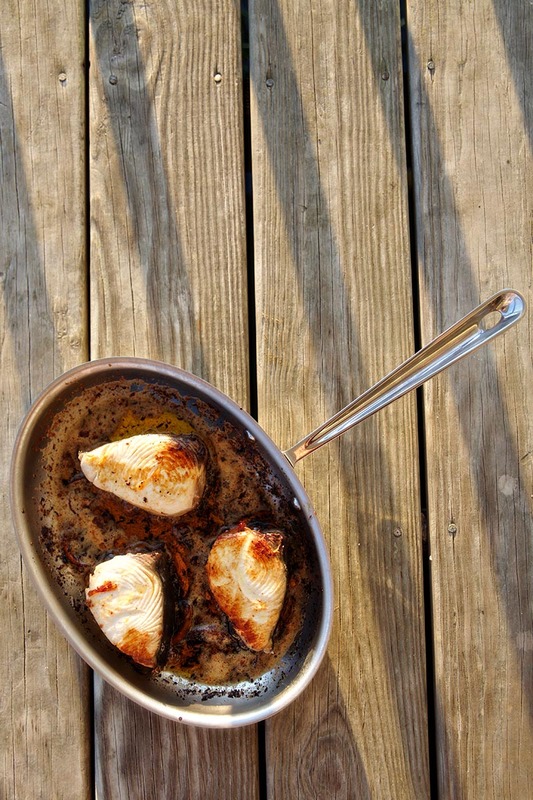 The folks at All Clad were kind enough to send us their new fish pan to test out, which we happily filled with butter, garlic, lemon slices, and fresh locally caught wahoo steaks. The riveted surface of the pan meant that the flakey wahoo didn’t stick, but did get a beautiful brown color. And, even better, the texture made it easy to clean afterwards (always a concern in the kitchen, but particularly a concern when you’re on vacation). With your pan over low/medium-low heat, melt butter. 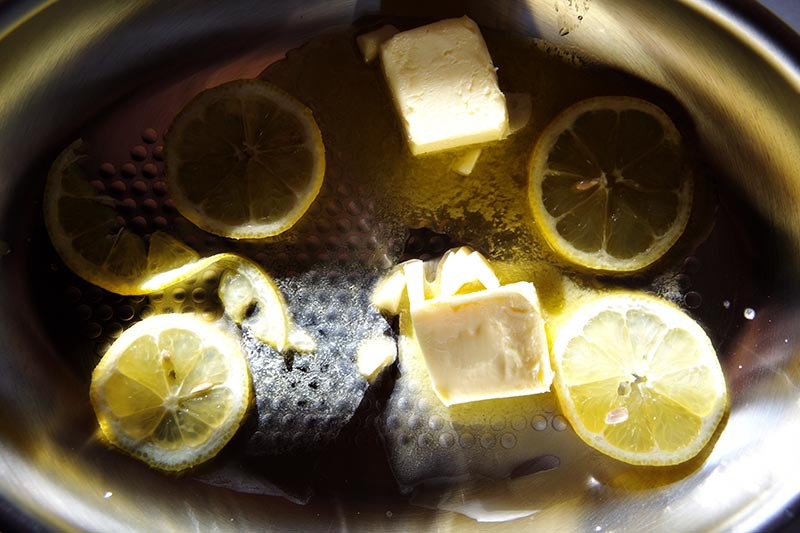 Add minced garlic and 3-4 lemon slices. 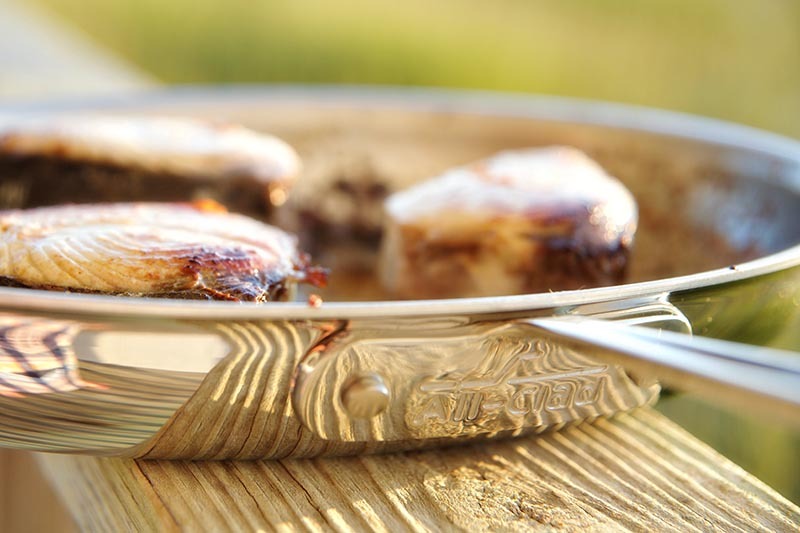 Allow butter to simmer, stirring occasionally, for 30 minutes, or until a golden brown. Salt wahoo steaks and heat pan to medium-high. Sear wahoo for 3-4 minutes on each side. Top with a squeeze of fresh lemon juice and serve hot. That looks delicious! My end-of-summer meal would be a good old-fashioned clambake. My recipe varies, but there’s a great Food Network one I’ve used a few times. Yum! 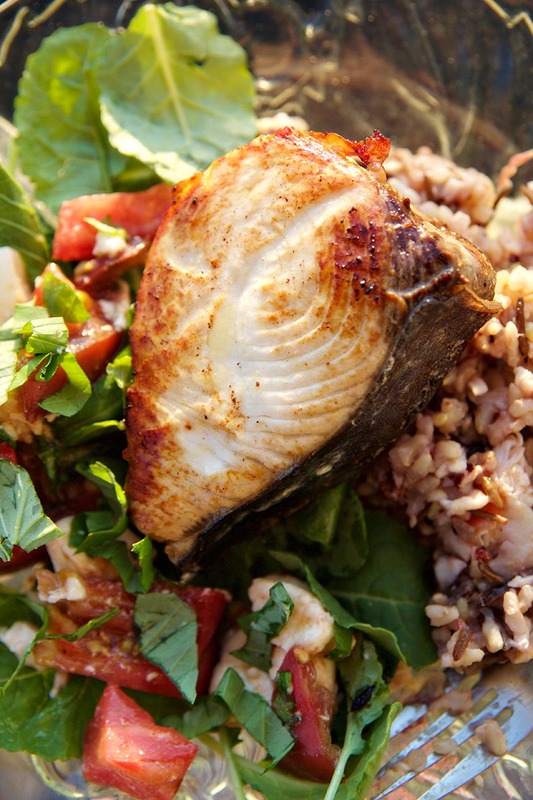 My favorite late-summer is blacken cajun tilapia with roasted peppers and rice! Has to be a clam bake!! Yum! Thanks all! Yum this sounds amazing! I’m all about some crab cakes during summer. This sounds amazing! Will have to try, out go to is Cajun pan fried trout with a mushroom linguine. Maryland Blue Crabs with the family. Picnic table covered in newspaper; crabs coated in Old Bay! Favorite summer food: left over spring rolls. Or, spring rolls with leftovers, I should say. I have a well known habit of making too much dang rice or noodles or what have you so we always have some leftover. I also have a “thing” about not wanting to reheat/overcook leftover fish or mushrooms or meat. So we have these things. In the summertime I layer them in spring rolls with fresh veggies and some dipping sauces and it never disappoints. But, post-relayed comment- I have never had wahoo. What have I been doing?! I live in Nebraska now, so my favorite late-summer seafood is “whatever I can get my hands on that is fresh!” Thankfully we have a quality fish market that flies in good stuff. I miss the bay though! Tomato + Shrimp Risotto is my new favorite late summer seafood recipe. Thanks for the giveaway! I love a good crawfish boil! Our little ones have really been into The Lego Movie lately so we are always doing Taco Tuesday – sometimes not even on a Tuesday. To keep it interesting, we’ve tried all sorts of seafood with our soft tacos: blackened Mahi Mahi, seasoned shrimp (blackened, citrus lime or Old Bay), grilled tuna and even fried cod. Of course, my husband reminded me a simple Dover sole meunière would be perfect in that All Clad pan! 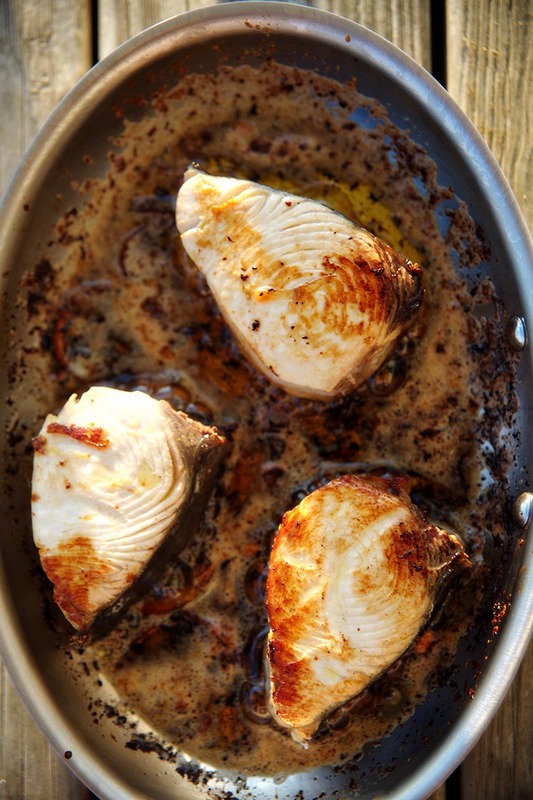 The Wahoo looks and sounds delicious and the All Clad Fish Pan is to die for! During this time of year in Eastern NC the weather starts to become cooler and I absolutely love a big pot of Conch Chowder with corn meal dumplins to warm me up. Our go-to seafood dish is baked salmon with pesto. Even my kids love it! But I may have to make then try this recipe too! I really love an authentic clambake on the beach! Even though you have to bundle up at bit at night, it’s still so much fun. Dinner was pretty tasty tonight. Sautéed shrimp and tortellini. Put a 1/2 dozen halved compari tomatoes in the oven this morning and left them at 200 degrees all day. Gathered up the last of the decent basil for a quick pesto. Added a generous toss of chopped garlic to the pan, and topped all with a handful of good Parmesan shavings. That looks amazing! We always love a simple steamed mussel dish with garlic, butter and shallots. Even my toddler loves it! That looks SO GOOD. Recently I’ve been loving tzatziki chicken salads — still light enough to really feel summery, but full of flavor and filling. Nothing beats a nice piece of snapper grilled outside with some salt, pepper, and paprika with a side of corn and pepper succotash. Salmon with a Cab reduction sauce. Mouth watering! A pan seared filet of walleye, or a perch. Or even a breakfast of blue gills. Walleye! We just got an old fishing boat and returned from an overnight fishing trip 2 days ago. We caught our limit of walleye and are having a fish fry tomorrow. I could eat walleye almost every day. Lucky me to live in Minnesota with a lot of lakes for fishing. My favorite late summer seafood dish is pan seared Lake Erie Perch, its kinda like eating candy! Another for walleye! Often we fry it, but broiled with citrus butter, sliced garden tomatoes and a little panko, or, seared for fish tacos is another fave! Shrimp Scampi with lost of garlic over a lemon linguine! 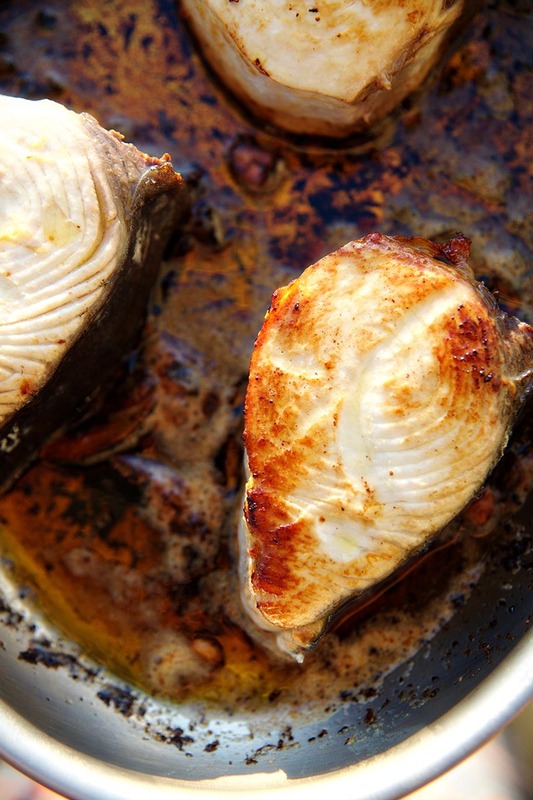 Any fresh fish pan seared is fine by me! We live near a beautiful river, and catfish, when that river is high? Oh man o man. Coleslaw or swamp cabbage and a plate of hush puppies? Keepin’ it simple. I’ve recently made tuna steaks with just olive oil and salt & pepper and finished with fresh lemon juice (with a side of sauteed eggplant) after Domenica Marchetti suggested it. SO good. This pan is gorgeous. Growing up I loved anything my dad brought back from being out on this sailboat: flounder, mackerel, snapper. I miss living on the coast! Beautiful!!!! My favorite is cioppino! I want this pan! Definitely old bay steamed crabs! Shrimp and grits. All 872 iterations, I don’t care, as long as the shrimp just came out of the ICW. Mmmm a cool shirmp and grits, salmon and zucchini, ginger pasta salad with any fish thrown on top… and always vodka. Mmmmm delicious. We eat seafood at least a couple of times a week and one of my most favorite ways to use it is in a Brazilian fish stew. It is dairy and gluten free, easy and quick to make and always tastes fantastic. You can use pretty much any fish and shellfish for this recipe. We love it with cauliflower “rice” and a nice glass of white wine. Have a great weekend! Looks amazing! Enjoyed some blackened catfish with grits and collards just this week, so good! I’m going to go with pan seared salmon with bright citrus glaze. Delicious on a bed of wilted arugula! Or pan seared scallops and carmelized peaches with crumbled bacon. And I also love lump meat crab cakes. Can you tell I’m a pescaterian, I love seafood! Simple meals are the best meals. Congratulations on your baby.